Host City: Tokyo, Japan Format: 42,195 metres (26 miles, 385 yards) out-and-back. Ron Clarke and Jim Hogan (GBR) were the early leaders, passing 10Km in a fast 30:14, with only Bikila, Hannachi (TUN) and Naftali Temu (KEN) in contact. At 15Km (45:35) Bikila, Hogan and Clarke were over a minute ahead of the chasing pack. Bikila – who’d had his appendix removed seven weeks earlier – went into the lead clad in shoes on this occasion, and at 20Km (1:00:58) was five seconds ahead of Hogan, with Clarke (1:01:39) now well back. Bikila extended his lead to 40 seconds at 30Km (1:32:50), with Hogan 1:29 ahead of Tsuburaya and Suto. Just after 35Km Hogan retired, and by 40Km Bikila was almost three minutes clear of Tsuburaya. Heatley was now third, just over a minute behind Tsuburaya, but the Japanese star was fading. Bikila won with a world’s best ever performance for the second time, and proceeded to warm down with some calisthenics to stupify and amuse the audience. Heatley caught the exhausted Tsuburaya with 120m to go to take the silver medal. Of the top eight, Edelen was the freshest finisher after Heatley, and Clarke continued to the finish, placing ninth in a personal best 2:20:26.8. Tsuburaya committed suicide early in 1968, still depressed by his “failure” in 1964 and his inability to overcome training injuries. Defending champion Abebe Bikila was back and was considered the favorite, having lost only one marathon in his career to that point – the 1963 Boston race. But he had several strong contenders, among them the American Buddy Edelen, who in 1963 had broken the world record with 2-14:28 in the Polytechnic race in Britain, and had also won the Košice marathon in Czechoslovakia in 2-15:09.6. Britain had two top marathoners in Basil Heatley and Brian Kilby. Japan was led by Toru Terasawa, who had won the 1963 Fukuoka Marathon, and broken the world record early in 1963 at the Beppu Marathon. But there was only Bikila. The race began at 1 PM, and was contested over a very flat straight out-and-back course. Bikila ran in the lead pack right from the start. By the turnaround point, this time running in shoes, he was leading by 15 seconds, and from there to the finish, he simply extended the lead, winning by over four minutes. Heatley finished second, but had been third entering the stadium. Third went to a native son, not Terasawa, but rather Kokichi Tsuburaya. Brian Kilby finished fourth, and Buddy Edelen, hampered by a sciatic nerve injury, placed sixth. This race saw one of the most emphatic victories in Olympic history. 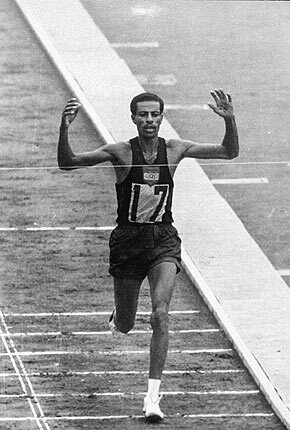 Abebe Bikila of Ethiopia won by a margin of 4:08. Not since 1924, when Albin Stenroos of Finland won by 5:57, had there been such a winning margin. As second-place finisher Basil Heatley put it, “I won the B race, because we were outclassed by Bikila.” The Ethiopian’s victory was all the more amazing because he had undergone an appendectomy only six weeks earlier. As the reigning Olympic champion, Bikila was the firm favorite for this race. However, his fifth place in the 1963 Boston Marathon showed he was not unbeatable. Still, he was clearly in good shape after two marathon victories at high altitude (2240m) in Addis Ababa (2:23:14 and 2:16:18). The Japanese were likely to be a threat. The experienced Kimihara had won their trials with 2:17:11, while newcomer Tsuburaya finished only a minute behind. And they had finished in the same order in a later August race. The evergreen Belgian Vandendriessche had won the Boston earlier in the year and was always in contention in big races. Americans had established star Buddy Edelen, who had set a 2:14:28 world best in 1963, as well as 10,000 winner Billy Mills. Then there was a strong British trio of Brian Kilby, Ron Hill and Basil Heatley. Heatley and Hill had both broken Edelen’s World Best earlier in the summer with 2:13:55 and 2:14:12 respectively; Kilby was the reigning Empire and European champion. Also of note was Mamo Wolde, who had pushed Bikila in his second Addis Ababa marathon to finish only 0.4 of a second behind. Then there was a wild card in Australia’s Ron Clarke, who had run so well on the track without earning a gold. to Bikila. No one else is in sight. Ron Clarke was the early leader he went through 5K in 15:06, with Irishman Jim Hogan on his heels. Bikila was 11 seconds back. Clarke maintained the fast pace, passing 10K in 30:14. Hogan and Bikila were with him. They had a 25-second lead on the strung-out field behind them. The leading trio were still together at 15K (45:35); the chasing group (46:41) comprised of Ambu (Italy), Temu (Kenya), Vagg (Australia) and Suto (Hungary). In the next 5K (60:58) Bikila moved into a 5-second lead over Hogan and a 41-second lead over Clarke. The next group (62:46) comprised of Demissie Wolde and Tsuburaya, Suto and Ambu having dropped back. Bikila passed the turnaround in 64:28 with Hogan still close. By 25K Bikila (1:16:40) had 15 seconds on Hogan; Clarke was still third (1:18:02) but he was being pressed by Suto, Tsuburaya and Wolde. A group in seventh was almost 3:00 behind the leader: Kimihara, Heatley, Kilby and Mills. Heatley finishes in second place in front of Tsuburaya. In fourth place, Kilby showed how consistent he was in big races. He had run with Heatley for almost the whole race but didn’t quite have the strength to stay with him after 40K. 1. Abebe Bikila ETH 2:12:11; 2. Basil Heatley GBR 2:16:19; 3. Kokichi Tsuburaya 2:16:23; 4. Brian Kilby GBR 2:17:02; 5. Jozsef Suto HUN 2:17:56; 6. Buddy Edelen USA 2:18:12. After the discovery of the phenomenon surprise Bikila at the Olympics in Rome (see article on this marathon to see the beginnings of Bikila), it seems logical to put favorite at the Tokyo Olympics, yet some events not in its favor and after a dark political case, a palace revolt formentée by the son of Negus, Sergeant Major Bikila was first thrown in jail for several months. There would have rotted if the Imperial clemency, already avoided the rope, had finally made ​​him right. In this lamentable plot, obedient indiscriminately, it was actually a toy. Then thirty five days before the start of the marathon, he was operated on for appendicitis, and remained ten days without training besides of course the legacy that is still an operation. That all these events make the suspect ilstalle a probable victory Bikila. Moreover Bikila was defeated during the Boston Marathon victim of cramps he had finished as 5th in the race, which made ​​him lose his invincible status. Anyway, Bikila has changed between the two Olympic marathons, he first learned to read and write, and then now he runs with shoes on and heal his look, he continued to travel made abroad, it could indeed appreciate the outfits worn by the stars of athletics. While all these events and changes will they make him lose his title? Tokyo will actually make the festival to marathoners, Japan worships the specialists in this field and the crowd will gather all along the route, a host of incredible density that will tell a British rider "I thought it was the coronation of Queen ".Yes truly it is a communion with the Nippon public who has organized things of course, starting with the opening ceremony and the Olympic flame was lit by symbolically a man born in Hiroschima the day the bomb exploded. Race The first to feel the itchy feet will be the Australian Ron Clarke and the Irishman Jim Hogan. Clark is a srperbe racer that will beat many timekeeping records but had great difficulty in man struggles to man, which made ​​it fail on the 1000m and 5000m, so he decided to enroll in marathon in desperation, hoping to improve on his two previous marathons where he often suffered from cramps. Bikila went more cautiously in the pack, despite all the passage of the 10th kilometer; the times will be maddening, Bikila was back on the two men go in 30'14 ", almost a minute better than during the Rome Marathon, the best time of Paavo Nurmi in 1928 which was 30'18" at 10000m. The Belgian Aurele Vandendriessche will eventually 7th race will tell also about lap times. "Marathon that goes too fast now for the really enduring runners would require 60 to 80 km run, it might disgust the 10000 meters sprinters ". Bikila will quickly show its superiority to the other two attacking and accelerating to demoralize his opponents, Clarke gives the first, Hogan is quick to follow, and the fantastic ride of Bikila can begin the cheers of the Japanese crowd. All those moments that will be filmed will remain in the collective memory as one of the strongest moments of the Olympic marathons. Bikila will cross the finish line in 2h12'11 ", outclassing his opponents, deaf to the roar of the crowd. Once across the line, Bikila began a stunning series of stretching and physical culture movement, the public does not believe it. later, Bikila had to confide that he had cared little grandstanding and did not seek to dispel some cramping and a fugitive stunning. this makes it at least more human !! Bikila just experienced the peak of his career, he does not know it yet, but before you see the end of his life, a story to be told. After the arrival of Bikila, a Japanese head between the stadium for second place. But just behind Kokichi Tsuburaya, the Englishman Basil Heatley follows and will double a few meters from the finish line, which is Japanese for a real national tragedy and a real humiliation despite the bronze and even as this Japanese beat his own record. The latter will never recover from this adventure for two years will be on him this humiliation without injury manages to heal. It will train harder than ever and the Japanese press will again be an Olympic winner. Then he will feel pain Achilles tendon, his stomach torment him. Finally, he will end his painful internal struggle by hara-kiri January 19, 1968, two months after his release from the hospital where he was operated on and stayed three months in bed. in a letter he left before killing himself, he apologized to his people from the affront he has inflicted. When talking about the Japanese pride, we have here an excellent example, and dramatic. Abebe Bikila to him when trained hard for the Mexico Olympics in 1968. Unfortunately, he had to give up after 15 km because of a broken leg race. His compatriot, Mamo Wolde won the race. Abebe Bikila participated in over 26 major marathons during his illustrious athletic career. He also won the World Championships in 1960 and 1960. 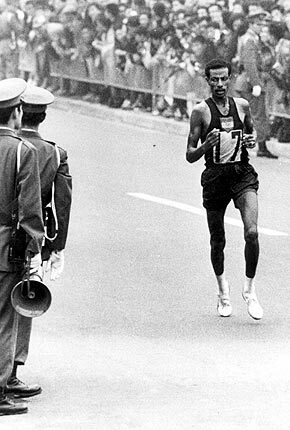 In 1968, the legendary Abebe Bikila was involved in a car accident in Sheno, a town 70 km from Addis Ababa. He pulled a paraplegic. During the nine months that followed, he was treated in Ethiopia and abroad. Even while he was in a wheelchair, the fighting spirit of Abebe Bikila and his desire to see his country's flag to float up a dull helped him to compete and win some race. In 1970, he ran a 25 km Norway and won the gold medal. In the same tournament, he won the 10 km and was awarded a special plaque. The illustrious life of the legendary Abebe Bikila ended tragically in October 1973 when he died following a brain hemorrhage. This eternal Ethiopian hero was buried in the cemetery of St Joseph church in the presence of a huge crowd and the emperor, Atse Haile Selassie.